The Indian cricket team is playing the second ODI in Mohali against Sri Lanka on Wednesday. 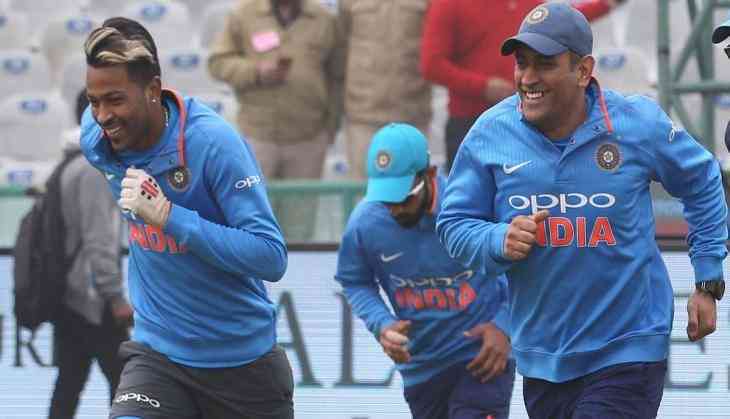 Prior to the match, there was a race between former captain Mahendra Singh Dhoni and all-rounder Hardik Pandya during practice. The video of this race is constantly becoming viral. This video is about 100 meters race between the two players. In race, Pandya lost to 36-years-old Dhoni therefore, the video is going viral on internet. Everybody knows about fitness of Dhoni who is still one of the best fit players, and remains active for his game. That is why 24-year-old Hardik Pandya got defeated from Dhoni. Dhoni has a chance to complete 10,000 runs in Mohali match. Dhoni who helped India to cross 100 runs with scoring 65 runs is just 109 runs away from making 10,000 runs in ODI cricket. Dhoni has so far scored 9891 runs at an average of 51.79 in 310 ODIs so far. Which includes 10 centuries and 67 half-centuries. If Dhoni achieves this achievement, then he will become the fourth Indian batsman to score 10,000 runs in ODI cricket. So far, Sachin, Dravid and Ganguly have done this work from India. The Indian team had to face defeat in the first ODI of three match series against Sri Lanka. The entire team was all out on 112 runs. During this time, only Dhoni was seen fighting alone. Dhoni scored 65 runs in this match.